We love hosting fall harvest parties: They’re a charming way to share your garden’s beauty—and bounty—with the people you love. And a key element of any garden party is what the guests take home (besides a renewed appreciation for fresh fruits and veggies). So we thought we’d share some of our favorite gift-from-the-garden take-homes with you, too. 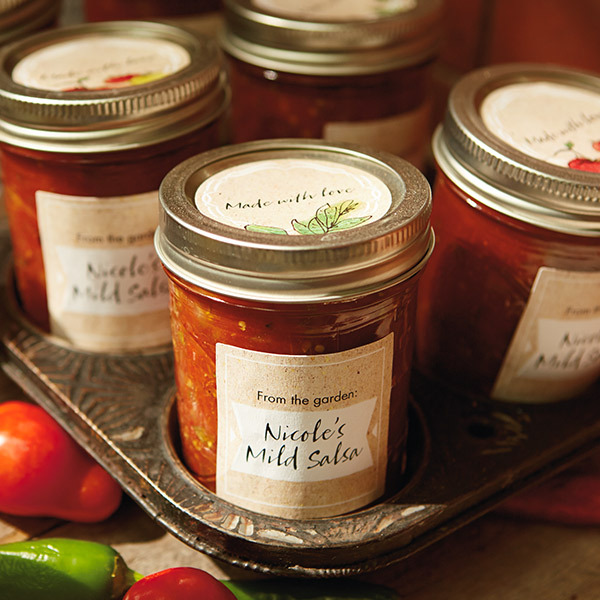 Read on for a variety of freshly picked party favor ideas, recipes and free printables, including herb-infused vinegars, canning jar labels, seed packets, food tags and recipe cards. Want more garden party inspiration? Try out our fall harvest recipes from Kansas City chef Mark Kelpe and these 5 fresh-from-the-garden fall desserts. Send pretty bottles of homemade herbed vinegars home with your guests—they’ll add zip to any recipe! We’ve included printable hangtags in addition to three recipes, so you can bottle up your own version of vinegar vim and vigor. How about some takeaways for next year’s garden? Seed packets make a great favor. They might even spark a major guerilla gardening movement in a neighborhood near you! Finish off the tables with our printable food tags. Use your best fancy calligraphy (or at least your best penmanship) to help set the scene. And don’t forget the recipe cards. Fill them out ahead of time so guests can take them home and recreate their favorites. Print out a few blank ones, too, for on-the-fly recipe exchanges. Nicole Cawlfield is a photo stylist, artist and novice gardener. She spends her time making things pretty, dogs happy, and her table healthful with the amazing veggies she babysits from seed.